I've attached an example pattern to the previous post. Yes, a finer IRE interval in the 100-140 pattern will do the same. But the steps have to be very fine, so the test of 136 to 140 is not fine enough. Last edited by James-F on Tue Apr 17, 2018 5:37 am, edited 1 time in total. That looks nice, it is a good idea. I'l call it a night for today though and test that tomorrow, and check if you have any response to teh previous one. I wanted to implement a simple game within the suite using those very close to black/white patterns, something like Arkanoid or a simple shmup. But I kind of feel like a pattern like these (with smaller tiles) could work better for each console. Thanks. 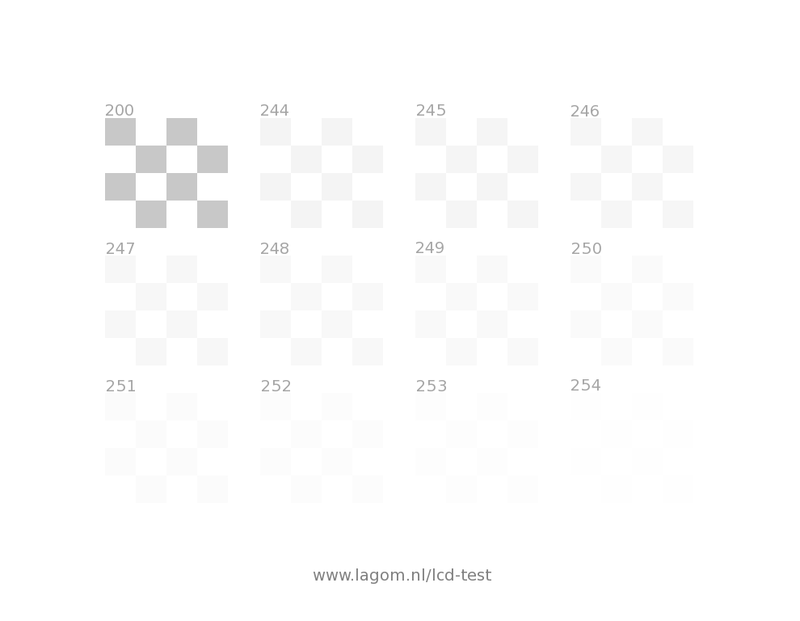 A simple pattern with 220-255 squares on white background will do, the finer steps the better. On a properly calibrated LCD monitor, one should see the difference between 254-255, and 0-1. Here is an update for the MegaDrive/Genesis version of the suite. It was triggered bt some requests by FBX and a small list of changes I had made. - Lag test is now up to date with SNES version, finally added the vertical colors changing bars fror LCDs aftre all these years. Sorry. - Video Options are now available everywhere, with UP+START on 3 button controller and Y on 6 button controller. - Video options now offers the Horizontal 256 mode for compatible tests and patterns. - Removed music track to make space and keep the same ROM size and Sega CD compatibility. It is now just a beep, like in most other versions of the suite. - Fixed old bug in Backlit zone test for screen limits, supports 256 as well. - Added brick layout subtest to sharpness, for a real case scenario. It includes what I believe will work on versions that do have the needed color palette for James-F suggestion, here it is in the genesis version with its limitations. I'll update SNES, PC Engine and Wii, GC, DC versions to meet these same options when appropriate during the next week. I should add that on all Japanese consoles like Sega, Snes, Nes etc,... 7.5 IRE is NOT black, 0 IRE is. The signal is indeed NTSC but Japanese NTSC (games and all), where black is actually 0 IRE. So 7.5 IRE should be clearly visible. so setting the brightness level on the CRT to lower the 7.5 IRE to appear black is ONLY for American NTSC content like broadcast TV, but absolutely not for 90's consoles. Thanks for the new version, Artemio! Are you still continuing development on the Saturn version? If so, do you have a rough ETA on release? Yes, it is always good to have those note sin public. The suite has always stated that for games you should calibrate with the 2% IRE bars in teh PLUGE and that the Genesis is 6% at its lowest. But also mentions the 7.5 IRE setup and offers patterns when possible for both. Thank you for the comment. Work is paused since work is being done on the SDK. But it is still in progress. There is no ETA, but we'll make our best. I've had little time lately, this new version of the Genesis was the result of a few free hours. The Saturn version has basic functionality working, but there are still several issues to fix. Thanks for asking. Last edited by Artemio on Sun May 13, 2018 1:59 pm, edited 1 time in total. Checkerboards for all three res modes would be great in that one too, btw. It's cool though, I've already sussed out optimal timings for all 3 modes on the OSSC anyway. Why is the Dreamcast version horizontally shifted to the right while in 240p mode? Switching to 480i centers the screen properly. I tested with VGA, RGB, and composite. I also tested the PC Engine CD version and did not have this problem. Only 240p Dreamcast (the default video output setting) is off center. I tested with a Sony XBR970 and consistently get 0 frames of lag (0.5 sometimes if I adjust the frame accuracy setting). Could something be wrong with my equipment/method/setup or are the complaints I read on the internet about HD CRT display lag overly exaggerated/unfounded? I haven't noticed any lag with this TV; I only did the test out of curiosity. I tested via RGB (converted to component) and composite video. Same results on both. I tried the manual lag test a few times as well and the results varied around a frame of lag, maybe two. And of course my SD CRT TVs show zero lag every time with the mic test. Just checked the values, I indeed modified some of the centering in 240p for the Dreamcast when adding the PAL modes and overscan in 2014. I can't remember why, but I will investigate and get back to you on that topic. I guess it was in order to center it within the DC signal when enabling the colored border. But I am second guessing myself. I don't know what your setup is, but the only way this test works is if the audio is directly played form the TV speakers (i.e. if it follows the same path as the video). Is that how you are doing it? having the audio be played directly and never delayed by the TV should always give zero lag. Did you try the camera test with both screens and a splitted signal? You can use composite and a "Y" RCA cable. Ok, cool. I thought I was missing something. That horizontal shift has confused me for some time. Yes, I definitely went through the tv audio system and speakers directly. No sound amp or external speakers involved. I do have another monitor near the 970 so I could do this if I get something to split the signal. I might try this. But I'm not too concerned about the lag since I don't feel any lag. Just curious if I missed something. For now I'll assume the mic test did it's job and the tv has near zero lag. Great software by the way! I've used the DC and PCE versions extensively. For now I'll assume the mic test did it's job and the tv has near zero lag. The test is very sensitive. I would only asume that it is not delaying the audio to match the video from that. I'll change the help to include this possibility, all the ones I've tested do delay the audio. I just did several rounds of manual and dual monitor lag testing and the 970 definitely has 2 frames of lag. So your assumption must be correct. Maybe it's such a small amount Sony didn't bother to delay the audio? I certainly haven't noticed. But I added a 35ms delay to the AV receiver I use with this TV...just in case. Does anyone here have a GameCube, a Game Boy Player, an EverDrive GB (or other Game Boy compatible flash cart), and a way to measure IRE levels? If so, I'd like you to try version 0.05 of the Game Boy suite, select "Solid color screen" (that is, White & RGB Screen) or "Motion blur" (which extends 100 IRE), and figure out what signal levels the GameCube is producing for shade 0 through 31. This should help me figure out the appropriate Game Boy Color RGB levels that correspond to 0, 7.5, and 100 IRE for the color balance tests. DRW brought it to my attention that the use of the word "Modern" invites confusion as to whether it refers to late-model CRT SDTVs (those new enough to have on-screen menus) or to newer LCD HDTVs. Is there a better way to phrase this? I believe it applies to both though. Better wording would be "on most digitally controlled displays"
This contains most of the same tests as my Game Boy Color port in a GBA multiboot program suitable for use with a flash cart or GBA Movie Player accessory. Use it to test your Game Boy Player or other solution for playing GBA on TV. Or just use it to brag about how the DS Lite trounces all in shadow detail. Known issue: The drop shadow/striped sprite, stopwatch lag test, horizontal and vertical scroll tests, and PCM sound test aren't ready yet. They'll arrive in a later version. Nice. FYI, Game Boy Interface can self-multiboot. I'll have to look into that with an SD launcher sometime. So anyway, I just tried Genesis version 1.16 to see what new features I'd have to put into the NES, GB, and GBA ports, when I noticed a few minor bugs. How hard would it be to make these changes to the Genesis version? It was designed not to respond when in an NTSC system, specially so people that have modded systems can notice it even when in NTSC. That's why it is checked in a dynamic manner. Fixed, also changed in SMPTE Color bar help and general help. I found it easier to set with two pixel wide ones, that's why I made them that way. Could later add the option to toggle them if required. Not designed for that behavior, for precision. This is a graphical glitch that results from changing the tiles to VRAM as far as I can tell. Right now I can do little about it, if you have a solution please make a pull request. I don't consider it important ATM. Thanks. I also added basic YM2612 and PSG tests to the Sound Test, these were made at FBX's request a while ago. I was waiting to release the other versions along with these changes, but they'll have to wait a bit. The way autorepeat works in my NES, GB, and GBA ports is that after a key is held, it waits 12 frames before the repeating starts. This lets me collapse some "do once" and "do every frame" functions into a single button, such as A and B of Horizontal Stripes (Genesis), A and R of Horizontal Stripes (Super NES), or Select for fast color mode of White & RGB Screen (Super NES). I solved this 3 different ways in the NES, Game Boy, and GBA suites. 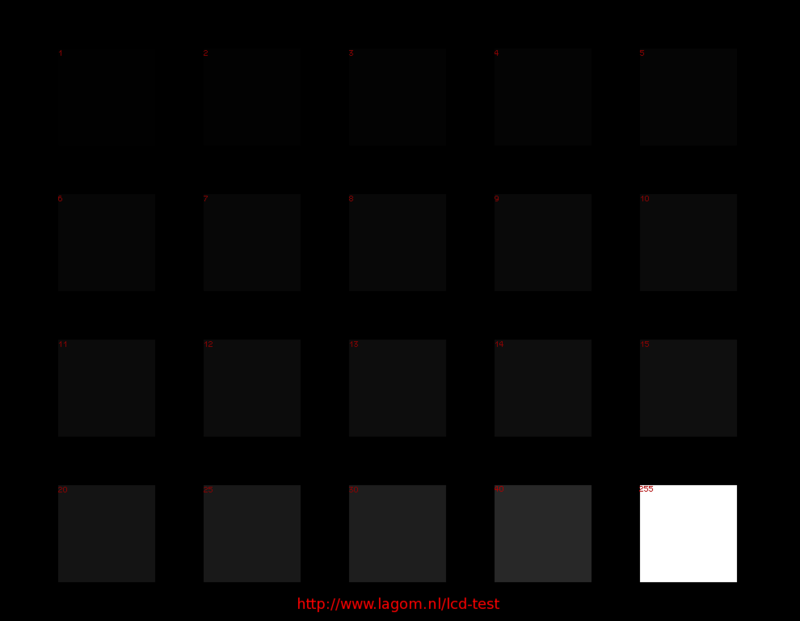 I load 7 tiles for 1-7 pixels filled in on the left, 7 tiles for the right, 7 tiles for the top, and 7 tiles for the bottom, plus the blank and full tiles. When the width of an edge changes, I need only copy in the single 30-byte column or 32-byte row affected by this change. (Usually on NES, there's enough VRAM bandwidth to copy in about five such columns or rows per frame.) The corners, where left or right meets top or bottom, are drawn with sprites. I use sprites to draw the "Top: 0px" etc. This lets me use background scrolling to draw the left and top edges. The right edge is a column of 8-pixel-wide sprites, with the window plane (similar to that of the Genesis VDP) to its right at a multiple of 8 pixels. (Window plane's starting position on GB can be set down to the pixel, but I use multiples of eight and the sprite column because the GB mono hardware shows a glitch if the window plane starts exactly 1 pixel from the right side.) The bottom edge is also the window plane, drawn with a vertical count interrupt to shift the window's starting position to the far left. If I were rewriting Overscan for the Genesis, I'd probably attempt this method first, with the amounts drawn on the background using high-prio plane B. But I don't know quite enough about programming the Genesis to know if the window can be shifted mid-screen. Like the Super NES, the Game Boy Advance has a "window" function that lets me enable or disable layers within a rectangle. I set it to show the background only inside the rectangle described by the window, with the backdrop color representing margin. if you have a solution please make a pull request. I didn't know SourceForge had pull requests (at least in the GitHub sense). After searching, I see they were added three years ago. It is not a matter of bandwidth from what I could see, it happens because I generate all tile sin RAM and modify the BAT on the fly. I wasn't sure which was the primary and which the mirror. Thank you for clarifying. 160p Test Suite (Game Boy Advance) v0.02 adds the remaining tests, making the Suite feature-complete* in under 46 KiB. Where did the "FireShark" emblem in Pluge Contrast come from? Do you use GitHub Issues, or should I continue reporting issues here in Shmups Forum? I've never used them but it shouldn't be an issue to start doing so. Cleaner for all. The fireshark emblem came form the game "Fireshark" from TOAPLAN. This pattern at the highest and lowest values on Genesis is mostly useless when compared to higher color consoles of course. Just wanted to drop a random - yet massive - 'thank you' to Artemio for the brilliant job. Thank you for your kind words Galdelico, it is great to hear that the work is useful. Believe it or not when I started the suite I didn't have PVM. A lot of things were created around that setup. This release is missing the Pluge Contrast test pending what Artemio decides to do with it on Super NES, whose palette precision (5 bits per channel) matches that of GBC and GBA.